I love this song. Matthew West sings this song with a broken heart. How can we ever help, ever notice the hurting world without one. We walk through this world with blinders on. What if God wants something different. In your world no one is ever hungry. In your world you tithe to the Church just enough to get you by..10% right? No more than that though God, you know I have bills and I need a new skirt. In your world everyone has a roof over their heads. "Break my heart for what breaks Yours." Today God wants you to care. He wants you to notice. Like a woman driven by compassion. It's time to step out of our comfort zones and act. You, dear sister, were created for a purpose far greater than you will ever comprehend and today it is your turn to act. To step out and say ok God, break my heart for what breaks yours, I serve You. Too often we ask God to heal our heart, to put patches over the broken parts..but maybe a broken heart is what we really need. A heart so broken that we can't help but cry with that widow down the street, a heart so broken we can't help but see a hungry child and immediatley turn on our heals and help. "Jesus didn't just preach a gospel. He lived one, and now YOU are His hands and feet. hands that are for more than writing personal checks. Feet that are for more than walking to Church or to the mailbox so someone else can be resourced to go." "Jesus went. He served. He listened. He healed." Jesus acted. Now it's your turn to act. What makes your heart break? What makes you uneasy in your seat? That thing that makes you afraid? The one that gives you goose bumps and makes you sweat, that is the very thing God is going to use in you to change the world. So move sister. Act. Go. "Dear Jesus, break my heart for what breaks Yours. Only then will I be able to move when you call me to move." LOVE this Mandy! 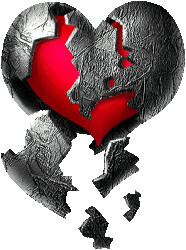 Sometimes we need a broken heart, God always has a plan! It's true,when your heart had been broken,you can understand better others.We must use our broken heart and as you say,go and do!